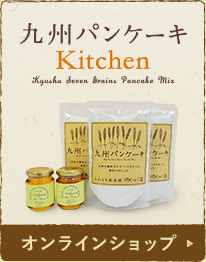 Hailed from Kyushu in Japan, the Kyushu Pancake flour mix combined fine selected grains from 7 different regions in Kyushu province to create its unique taste and texture. By working with the farmers on producing and purchasing their best crops of grains, we are able to ensure the highest quality and palate with the best ingredients. This is our assurance to you, as a consumer that you get a safe and delicious product. 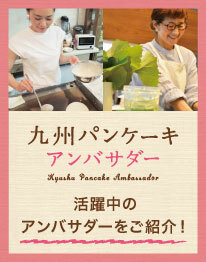 The Pancake trend catches on in the last few years as pancake becomes popular in Japan. In the past, pancake was not common but “Hot Cakes” were more readily available. The founder of Kyushu Pancake Flour Mix, Mr Koji Muraoka, recalled that it was the happiest occasion as a child when his parent took the family for a hotcake meal at the department store. It was always a joy for young Koji to watch his mother creating delicious hotcakes in the kitchen. It made another comeback in the last few years as there was a revival of Pancake consumption trend. The revival brought back people’s memories of the good old days as Kyushu Pancake introduced once again the taste of goodness and happiness in our products. Koji grew up in Miyazaki Prefecture, a region who pride themselves with their fine agricultural produce. After returning home after graduating from University in US, Koji devoted his time to the trade promotion of the Kyushu produce to the rest of Japan and the world. He wanted to give an extra push to promote economic value creation by showing the world how we could make positive contributions through better and safe food produce, in particular, from the Kyushu Province. The pride and commitment exhibited by Kyushu Pancake enticed the famed videographer, Mr Naoki Imamura to start a year long project to document the production story. His team visited each farm where the grains were grown as they traced the activities from sowing of seeds to harvesting. He further explored in depth, through interviews, the aspirations and belief of the farmers in producing the pride of their crops by ensuring that the consumers got their best produce. The success in the documentary, created awareness of the farmer’s noble aspirations, heightened awareness and peace of mind in food safety and consumption.